These casino sized chips are 11.5 grams in weight. They are produced from a composite resin and an insert that gives them the weight feel of a heavy casino quality chip. What makes them unique however, is the high resolution graphic label that is applied to the chip. This graphic is of the highest quality and offers players a chip with a superior look and feel. All chips have a colorful image of a 4-of-a-kind poker hand in aces surrounding the denomination. Each denomination is a slightly different label color, matching the color of the chips' stripes. The best part about these chips is that they already have the denominations on them. 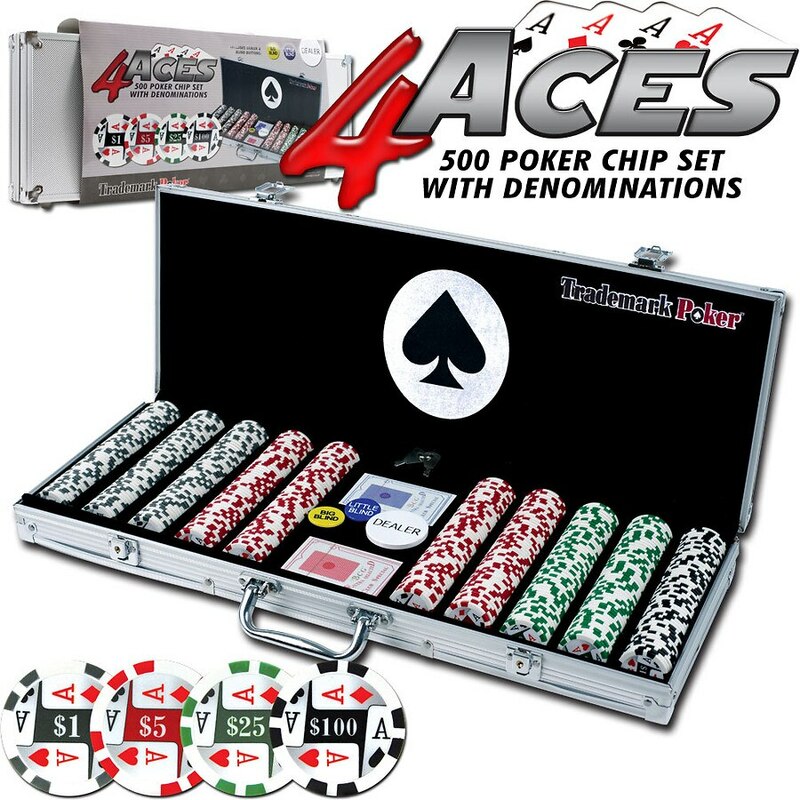 There are four different denominations in this chip series, including $1, $5, $25 and $100. Play your No Limit Hold'Em games and all your other high stakes casino games with these chips! Or play low stakes games too. These chips are very flexible for any game. The detail on these chips is flawless and their unique design makes them great for casinos and homestyle play alike. Your Chips will be protected in this aluminum case. It will provide the most protection for your investment. It is made of heavy duty, yet lightweight aluminum available in brilliant silver. The interior is black velour with space for 500 chips, 2 decks of cards and 3 buttons. The handles are are securely riveted for long lasting use. This is the chip case that will last a lifetime. We have included in this set 2 decks of cards and 3 buttons - dealer, big blind and little blind.